The innovative online service that turns photographs into unique jewelry pendants. Crescent Moon Jewelry’s™ new and unique online custom jewelry service captures a silhouette from a photograph of your magical moments, using state of the art technology to transform a two dimensional photograph into three dimensional gold pendants. If you have a child who will be performing in a recital, dance competition, cheerleading competition, or gymnastics meet, these memories can be made to last forever by capturing their most beautiful moments in a custom Crescent Moon necklace with their favorite dance, athletic, ballet poses and more. The process is simple. By simply visiting http://www.crescentmoonjewelry.com, customers have the option to purchase a custom pendant with their metal of choice. The customer then uploads their photo and Crescent Moon Jewelry™ creates a silhouette of the photo and transforms it into a beautiful personalized piece, shipped to their doorstep. 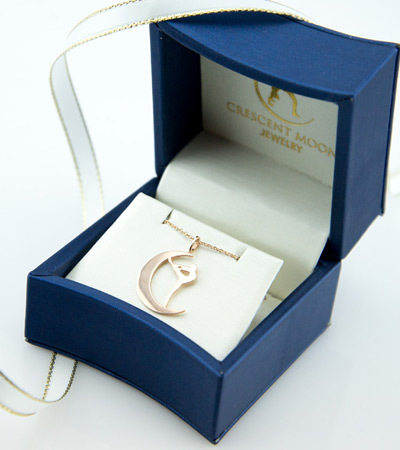 For that special touch, Crescent Moon Jewelry even offers customers the choice of having their custom pendant wrapped in a luxury gift box with a gift message. Pendants can be made in 14k yellow gold, 14k white gold, 14k rose gold, silver, yellow gold plated, or rhodium plated. These novel custom necklaces provide the perfect way to document special occasions such as weddings, engagements, parenthood, birthdays, graduation, Sweet 16, bridal parties and special holidays such as Christmas, Hanukkah, Valentine’s Day, Mother’s Day, Father’s Day and Easter. With this new service, one can create the ideal gifts for best friends, family, brides and grooms, romantic occasions, or party favors for a girl's birthday party. Pet lovers can also order pendants of their pet, and proudly wear a silhouette of their furry friends on their neck. Short of time or lacking inspiration? 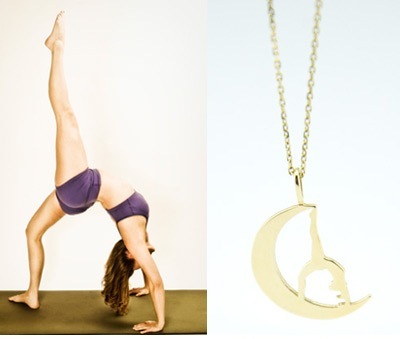 Crescent Moon Jewelry™ makes it possible to purchase a Gift Card for loved ones, and allow them to get creative, or choose from the Crescent Moon collection of ready-made pendants in dance silhouettes, cheerleading, gymnastics, yoga, Pilates and softball poses. Crescent Moon Jewelry™ captures a performer’s magical moment through state of the art technology that transforms a two dimensional photograph into three dimensional gold. The pendant crafted is an exact replica of the photograph you send, so no two pieces are the same. The legs, hands, and angles of the performer are brought to life in a one of a kind jewelry piece to cherish forever. Pendants can be made in 14k yellow gold, 14k white gold, 14k rose gold, silver, yellow gold plated or rhodium plated. Crescent Moon Jewelry™ pieces make the perfect gifts for birthdays, Sweet 16, Quinceañera, graduation, Christmas, Hanukkah or after a special award, performance, or game, or any time of year to celebrate you or how much you love who that person is and how they express themselves. Crescent Moon Jewelry™ donates 5% of all website sales to the REACHability Foundation, a Foundation that supports an adaptive sports and recreation program for children and young adults with special needs.